Sheraton Fiji Resort is stunningly situated on the tropical oasis of Denarau Island. Contemporary and modern, Sheraton Fiji Resort's 297 guest rooms are warm and welcoming, providing guests with many of the comforts of home. Designed with comfort in mind, the refreshingly spacious guestrooms and suites are beautifully furnished in harmony with the idyllic South Pacific setting. Photo copyright Sheraton Fiji Resort. Video copyright Sheraton Fiji Resort. 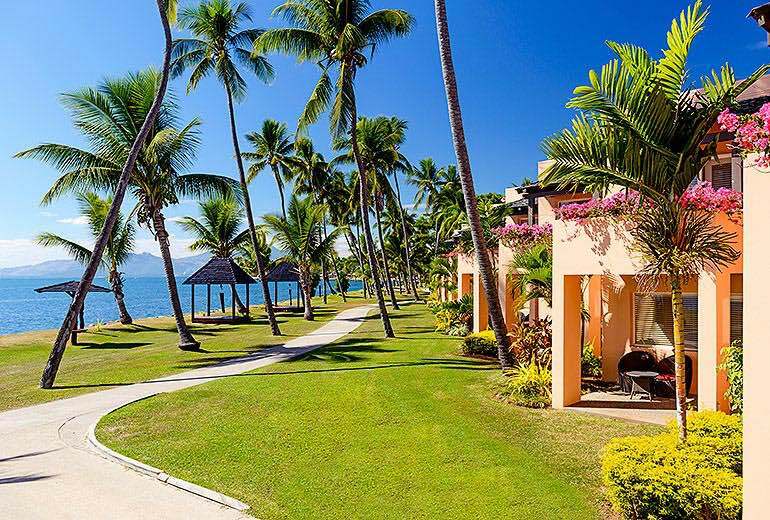 Sheraton Fiji Resort is your tropical oasis in the heart of the South Pacific. Stunningly situated on picturesque Denarau Island, the resort is an ideal playground for vacationers and families seeking to experience an array of dining and leisure activities including golf, swimming, water sports, and the action packed Kids Club, ensuring fun and excitement for all ages. The resort's 264 spacious guest rooms are contemporary and modern, each with its own balcony or patio offering spectacular views of the gardens or ocean. The guest rooms feature the Sheraton 'Ahhh' Sweet Sleeper Beds, generous sized bathrooms with dual vanities, 32" flat screen televisions, internet connectivity and your choice of a king size or two double beds. Sheraton Fiji Resort is only a 20 minute drive from Nadi International Airport. Guests enjoy access to facilities at the adjacent Sheraton & Westin Resorts. Contemporary and modern, Sheraton Fiji Resort guest rooms are warm and welcoming, providing guests with many of the comforts of home. Designed with comfort in mind, the refreshingly spacious guestrooms and suites are beautifully furnished in harmony with idyllic South Pacific setting. Each room features the finest amenities including the cushiony soft, Sheraton Sweet Sleeper Bed, 32'' flat screen TV, high speed connectivity, work desk and innovative mood lighting to ensure a truly relaxing experience. Like a shared secret, a meal creates the feeling of being included in something special. Guests are invited to experience the enticing array of restaurants and bars at our resort complex. As a valued Sheraton Guest you can enjoy convenient access to the restaurants and bars at the adjacent Sheraton Denarau Villas, The Westin Denarau Island Resort & Spa, and the Denarau Golf & Racquet Club. Simply charge your bill back to your Sheraton Fiji room account. As guests at Fiji's only five-star integrated resort complex, Sheraton Fiji Resort guests are able to access all the facilities at the adjacent Sheraton Denarau Villas and The Westin Denarau Island Resort & Spa. Relax and soak up the sun by any of the six swimming pools. Indulge at a tempting selection of restaurants and bars. Enjoy a variety of other water sports or rejuvenate with a pampering treatment at the awarding-winning Heavenly Spa by Westin and many many more to dos! Sheraton Fiji Resort will make your important event the most successful and memorable it can be. The resorts' team of professional event coordinators can provide all aspects of creative assistance, whether you would like to choose from an extensive range of themed events or create your own. The Sheraton's extensive meeting areas are equipped with state-of-the-art facilities to invite a meeting of the minds, while wireless access points allow delegates to stay connected with on the road. The resort offers an array of versatile indoor and outdoor venues including the Denarau Events Centre as well as its very own private island catering for a range of events and some of the most amazing themes. Whether you are holding a discreet business meeting or an elegant cocktail party for 1200 people, our dedicated conference managers are on hand and committed to the highest level of service to ensure that your delegates feel welcomed in a warm and friendly environment.